Starting from the idea of the green city, the federal school building is conceived as a flat, terraced green landscape. The ground floor level opens to the maria-trapp-platz. Here lies the large, rain-protected school square – the main entrance to the school. The general areas of afternoon care, administration and the department of economics and informatics lie at this interface between the public space and the school. 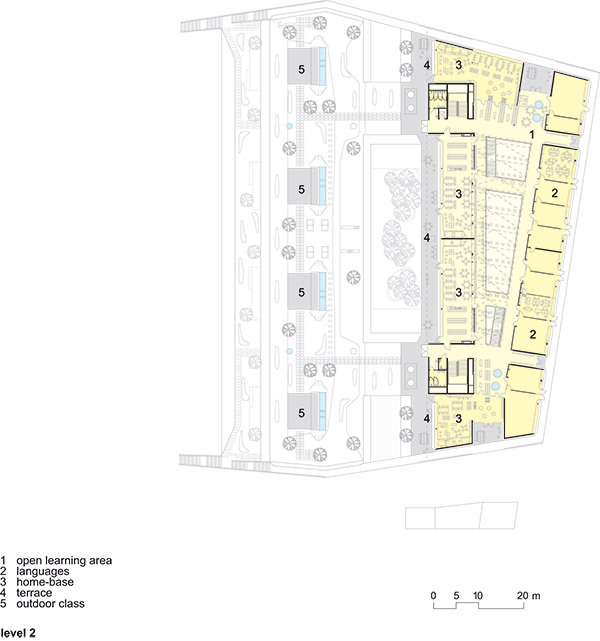 For optimum lighting of the compact building, an open space has been cut into its centre, designed as little school woods, to which the library, dining area and multi-purpose room are oriented. The indoor campus offers space for events of all kinds. It is a meeting point for all pupils, invites to sit and watch, is a space for recreation, playing and learning and enables good orientation inside the building. D the warm season, dining room, multi-purpose room, library and workshops can be opened to covered open areas. This allows eating or relaxing in the open air and working in outdoor studios. The educational units of secondary level 1 are clearly arranged and structured on the first floor. Four classrooms with the open learning zone and adjoining rooms are connected a cluster. 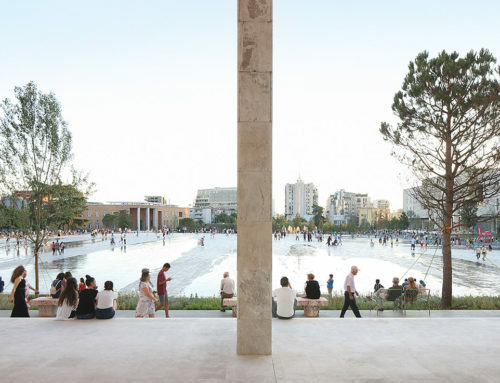 All four clusters are orientated towards the park via the open spaces in front of them and have direct access to the terraces. Large roof sheds extend the space of the open learning zone in its height and additionally provide for optimal lighting. The classrooms of a cluster can be opened fluently and expanded to the learning zones through sliding walls. The building as a landscape with flowing space transitions according to an ambitious space program.